Cucumber-Onion-Tomato Salad is a lightning-quick, easy salad that pairs nicely with spicy dishes. Vegan & gluten-free. I also call this easy side dish “Accidental Salad.” Why? 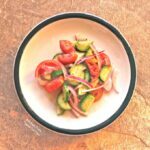 This incredibly easy, healthy cucumber-onion-tomato salad came about one time when I was casting about the refrigerator trying to decide what I could possibly throw together for a vegetable. 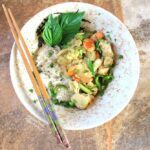 (Back-story: I made a New Year’s resolution last year that I’d serve vegetables with dinner in an effort to get the Frank family to eat more healthfully in 2016 [more on that here]). I had only a cucumber in the refrigerator and a tomato in the fruit basket. No lettuce was to be found. Rooting through the pantry turned up a red onion. And there it was: I decided to thinly slice the onion and toss it with chunks of cucumber and tomato in a light vinaigrette dressing and called it salad. 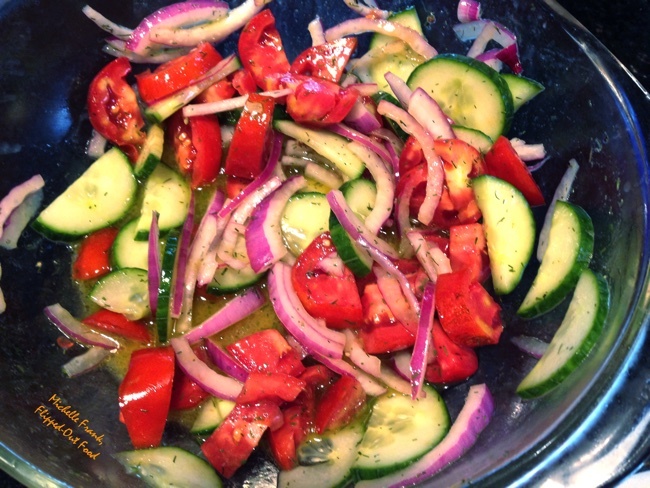 I now make cucumber-onion-tomato salad (cumbersome name, I know, but…?) on purpose all the time. I especially like to serve it with spicy dishes like curries or Jerk Chicken: the salad is cool and also acts as a nice palate cleanser. 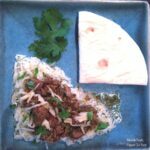 It’s a similar concept to the raitas served in Indian cuisine. In the recipe below, the dressing will make way more than you need. This is the Flipped-Out Food MO: make large quantities of stuff so you have it on-hand later for busy times. I store extra dressing in a jar so that all I have to do is give it a shake before putting it on my salad. 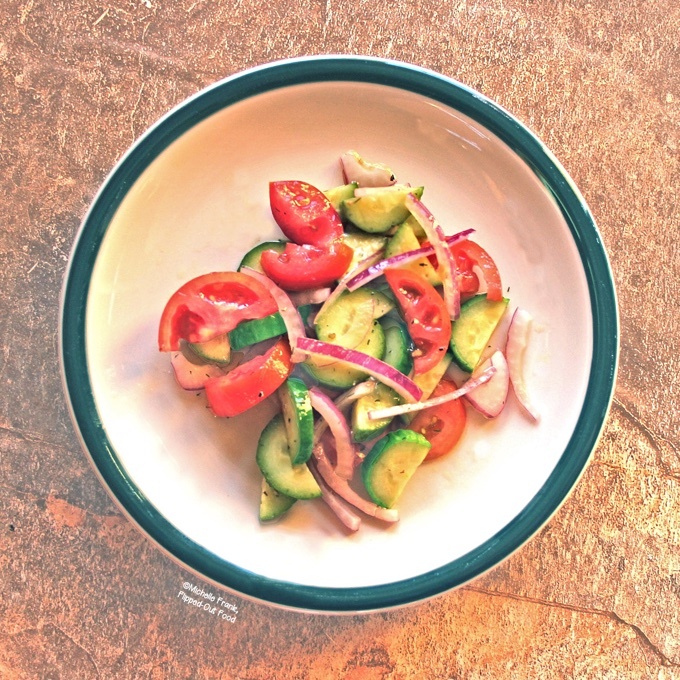 Cucumber-onion-tomato salad is gluten-free and vegan (provided that you use a vegan-friendly dijon mustard). Be sure to check out the recipes that pair well with this salad (below). Enjoy! 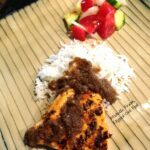 #CookBlogShare, a weekly food blogger recipe sharing party hosted this week by Everyday Healthy Recipes. 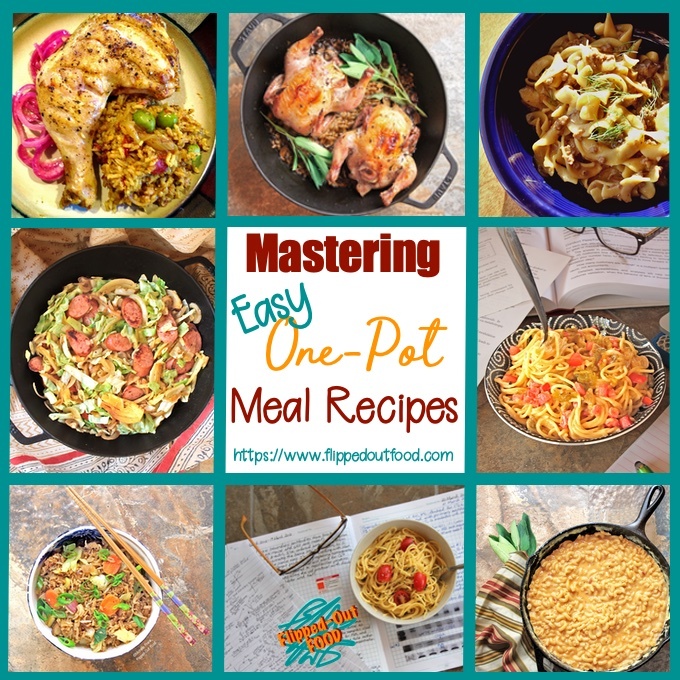 I linked this up with a previous #CookBlogShare as well. A cool, light salad that comes together in less than 10 minutes. Pairs well with spicy dishes. Add the ingredients for the dressing to a jar with a tight-fitting lid and shake. Combine ingredients for the salad in a bowl. Toss with about 1/3 of the dressing. Reserve remaining dressing in the refrigerator; bring to room temperature and re-shake before use (see Recipe Note #2). Many dijon mustards are not vegan. Westbrae Organic Dijon Style Mustard is a safe bet (it's on PETA's official list of vegan condiments!). This recipe makes extra dressing to use on additional salads (it's great on leafy greens as well!). Keep the leftover dressing in the refrigerator for up to 1 month. Thank you, Eb! You’re absolutely right: salads like this do keep well in the fridge for an easy side later on. 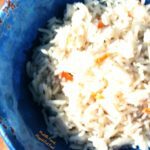 I like to eat the leftovers atop cottage cheese—or even rice!